If you think the Disney Vacation you want is out of reach then think again. This trip does not have to become a financial nightmare. Use these tips to save money on your Disney Vacation. Tip #1 – There is more than the theme parks. I know most of you are visiting Walt Disney World for the major theme parks. I don’t blame you…we all do. Keep in mind that the 4 main Disney World theme parks are the most expensive thing to do at Disney but not the only thing to do. If you didn’t know already, going to Disney World is tiring. You almost need a vacation from that vacation. It doesn’t have to be though and that can be an approach that is better for your pocket, family, and sanity. Here are some things that are free, easy, and fun. Disney Springs (Disney’s dining, shopping, and entertainment district) – Take a stroll through Disney Springs and do some window shopping. It is a totally different ambiance during the day and at night. Resort Hopping – It is “adventure” like to go exploring other resorts. You can couple that with a meal at a resort restaurant. Welcome to saving at least 35% off your room rate at Disney World. Disney Vacation Club (DVC) is Disney’s version of a timeshare. You can find out more about that here. You can occasionally rent DVC points for a one time use either from an individual owner or a store/brokerage. 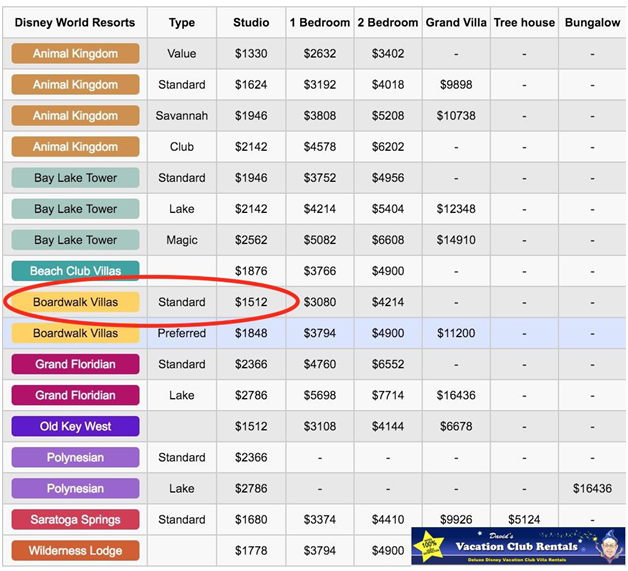 This chart is from David’s Vacation Club Rentals which is a BBB Accredited company that helps connect DVC members, who are renting their points, with renters. Here is what the price for the same room, same dates, looks like from Disney. Disney is expensive enough on its own. This tip will help you get the most bang for your buck. 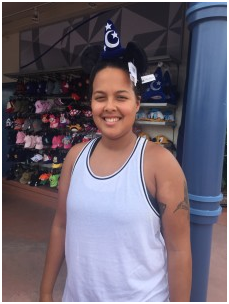 If you are interested in renting DVC points I suggest reading this article. I do not suggest renting a vehicle while at WDW. You don’t need it. While this tip is not going to save you thousands of dollars, it will save you hundreds and even better, a ton of effort. Take advantage of Disney’s free transportation systems. Use these options in any combination and stop worrying about rental fees, liability, tolls, gas etc. Thanks for tuning into and visiting Disneyways. What tricks/tips do you use to save money on your Disney vacation?